With Thanksgiving right around the corner and Christmas not far behind. I’ve been gathering design ideas for the room we all end up in during the Holidays, the dining room. I’ve compiled images that have and obviously coastal style, as well as many that combine transitional and vintage elements along with farmhouse and Scandanavian styles. Regardless of the type of interior design style you have in your home, the images in this post all contain natural elements such as pumpkins, evergreens, and shells which work with any style. This dining room has a lot of contrast with the dark stained table and the white pumpkin accents. The aqua salad plates and little gourds in the center of the table add a coastal touch that I think could carry over the Christmas holiday and beyond by changing out the pumpkins for pine cones and adding some evergreens. This dining room has a clearly coastal vibe with the blue and white theme. The blue glass bottles are a perfect contrasting color to the autumn leaves on this Thanksgiving table top. In the dining room photo above we see a hint of blue on the plates, but it’s really the use of the starfish mixed with evergreens and pinecones that makes this feel like a coastal holiday setting. There’s a bit of French Country happening in this room and it all works well together. I love how the dining room above feels both transitional and a bit rustic with the natural oak table top and the veggies in the center piece, yet there is a richness and sophistication to this room. Absolutely love the square shaped table and the grey upholstered chairs. 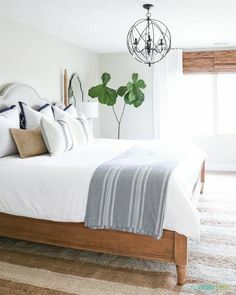 This room has elements of Farmhouse style with the painted bench and table, but the light fixture and neutral color scheme make the room more transitional. The wooden chargers with bark edges, the greenery, and the sheep skin are wonderful natural elements that could be used for both Thanksgiving and Christmas Holidays. There is a vintage appeal in the dining room above that I love. The natural fiber rug, oak table and bentwood cafe chairs are very neutral, and the textures stand out against the stark white walls and dark oak floors. The drum pendant light above the table really makes the room feel current and a little Scandanavian. The natural evergreen wreaths that frame the chalkboard above the server are just enough to add the Holiday spirit to the space. Speaking of Scandavian, this room really shows that look beautifully. I love the light and airiness of this space. They’ve scattered mini pumpkins throughout which is perfect for Thanksgiving, but you could easily change this to a dining room decorated for Christmas by switching berries or pomegranates or the pumpkins. They would be beautiful against the white furniture. Want to add that coastal touch? Incorporate come conch shells or starfish and voila! I think the dining room above feels a little eclectic and SO cozy. You get the vintage vibe from the black bentwood cafe chairs which contrast beautifully with the white walls. The deep greenery on the mantel and the table balance with the black chairs, and of course the sheep skin makes everything feel cozy! I feel like this room would work with any holiday celebration you might have. Here’s another dining space with black chairs. 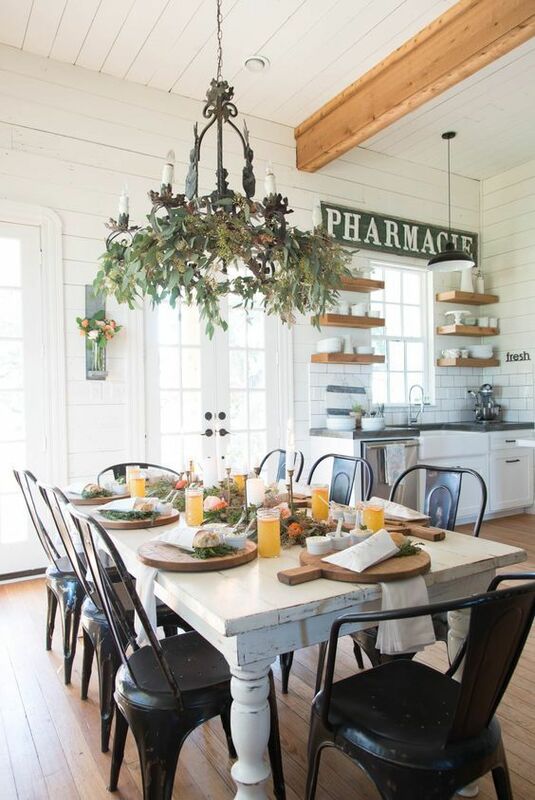 Technically this is probably an eat-in kitchen, and not a dining room, but I love the way they decorated the table top with the greenery and clementines. I also love the salad greens on the cutting boards and baguettes at each place setting. This looks like a wonderful family gathering space that definitely screams Vintage Farmhouse. In the dining room above, you can see the same black metal chairs that were in the last room, on one side of the table, a bench opposite them, and natural rattan arm chairs at the head of the table for another vintage Farmhouse room. The texture of the natural fiber rug adds warmth and the natural greens and white pumpkins serve as a beautiful backdrop to Thanksgiving dinner. The dining room above is probably the most Traditional of all the dining rooms I’m sharing today, yet the slip covered side chairs, burlap table runner, and natural fiber rug give the room a casual sophistication. Brass candle sticks and natural greens on the table balance well with the evergreen wreath on the gold mirror. That wraps up my 10 favorite dining room looks for the Holidays. Do you have a favorite? If so, which one? Were you inspired by the natural elements in each room regardless of the interior design style? I’d love to hear from you. Hope you have a wonderful Holiday season!